The Shiva Mahapurana is said to have come from the mouth of Lord Shiva Himself. It is an encyclopaedia of various branches of knowledge and ancient esoteric wisdom, handed down through the ages by the grace of the sages and rishis of this holy land of India. It is arranged in seven Samhitas and written in the Sanskrit language. The rarest pearls are hidden in the depths of the ocean and the most precious gems are embedded in rocks. One has to depend on someone to delve deep into the heart of the ocean or chip off the encasing rocks and expose these treasures to our eyes. Modern man has neither the time nor the knowledge of this ancient language to go through this voluminous book, however, wonderful it may be. Vanamali has condensed and picked out the most perfect of the pearls of this ancient wisdom and given it to us as in a form which is easy to read and simple to understand. The Veda presents the cause of the entire jagat as Mayin, wielder of maya, who does not come under the spell of maya, The Mayin is Maheswara- the Lord of all. He is not only the intelligent cause of the jagat but He is also in the form of the jagat. Space, Time and everything in space and time, are His manifestation and therefore not separate from Him. He is therefore both the father and the mother of the universe. Every form is His form and you can invoke Him in any given from. If you look at this Maheswara from the point of view of any manifest force or law, He becomes a devata. If you give a name in Sanskrit to this devata, the name will be descriptive of the form. Thus the name Vishnu means that the Lord is all-pervasive. The word Brahma means the one who is big without a limit. The word Rudra means the cause of tears as the giver of the fruits of actions and also one who is the remover of all tears. In any of the names and forms of worship, you can invoke the Maheswara as the one who is the cause of manifestation, sustenance and dissolution. In the Shiva Purana the whole Lila of Maheswara is presented in a style that offers the readers a scope to explore and discover. One gets to know what it takes to be almighty. An insight of every virtue in its infinite measure is unavoidable as one goes through any Purana. The author, Vanamali, present the Lord as one who is invoked as Shiva as depicted in the Shiva Purana. The author's devotion to the Lord imbues her pen with facility of expression and helps the reader discover the glories of the Lord and leads to devotion. The author is a recipient of the Lord's blessings and by converting these blessings in the form of presenting the glories of the Lord; she becomes once again the recipient of the Lord's blessings in abundance. Puranic literature spring s from a deep need in the heart of the human being for fulfillment. It plumbs the depths of our psyche, which cradles in it, an unconscious and indescribable longing for the Supreme, and comes out with the most fantastic images and conceptions, which have baffled the mind of modern man. Those who have been brainwashed by modern scientific preconceptions, whose imaginations have been stifled by strict adherence to a truth which only the senses can see, may find it difficult to read the Puranas and to understand their deep insight into human nature. But those, whose intellects have not been stunted by these constricting notions, will delight in the absolute freedom of expression and the amazing fights of imagination to which the human mind can soar. What must be remembered is that the forms of the gods are not mere flights of fancy but they are meant to reveal the many facets of Truth, which are not perceivable to the five senser. These five sense are limited at best and deceitful at worst, for their main aim is to conceal a Truth, which is incomprehensible to them. The modern world-view knows only of heat and motion, energy bursting out in the Big Bang, some fifteen thousand million years back and expanding into a system of galaxies which is running down from a state of maximum heat and concentration, to a state of cold stillness and disintegration, during the course of a vast period of time. Life and consciousness, as we know them, are claimed to be secondary phenomena, which will pass away into the cold ambiguity of death in this meaningless dance of the elements. Consciousness has no special significance in this view of the cosmos. The scientific outlook is quite sceptical about ultimate values. There is no purpose, no plan in the universe and intelligence itself is only a by-product of matter, condemned to perish in the course of time. For one who is convinced of this view, the Puranas will only be a source of amusement. Which modern mind can believe in oceans of milk and five-headed gods! The Puranic view of creation unlike the modern scientific view has its basis in the will of the Supreme Being. The ancient sages or rishis of India knew that matter is only a derivative of consciousness and contains within it, in seed form, the fundamental knowledge of its own inner spiritual potency, just as the whole of the mighty banyan tree is contained in its tiny mustard-like seed. There is an invisible field of energy prior to, and underlying the whole of this visible field. This field is unmanifest and not within the grasp of our five sense. The entire field of visible objects is only a projection of this. The rishis were well aware of this. Lord Krishna calls this field, avyaktha or the Unmanifest from which all this manifestation has sprung. Beyond even this field is the vast field called chidakasha or the field of consciousness, which is potent with the power to create? This field of consciousness, which is potent with the power to create. This field is also called Shakti or the creative aspect of the Divine. It is the feminine principal that is capable of all action and creation and hence it is known as the Divine Mother. The universe and all this phenomenon of life cannot really be called a creation, but a projection of the Divine Consciousness that appears inert but which is actually pulsating with life. The creation is not a making of something out of nothing, by someone, but it is a projection of that which has eternally existed. Science may have discovered many physical and chemical laws that govern the universe but it is yet to discover those transcendental laws that are fundamental to it. These spiritual laws are eternal and inherent in Nature. Based on a cyclical conception of Time, Puranic history has a much wider scope than the modern, limited concept of human history. Modern history linear has no idea of where and when the line started and where it might end. What was there, before the beginning and what will come after the end? These are questions that the modern historian cannot answer. Only the unthinking mind will be satisfied with such a concept of history. The Puranas, however, give us cosmic history. An intelligent reading of them would enlarge our vision and give us a totally new concept of the history of the universe. We will be made to feel that the history of the human being is not simple or as short as modern historians would have us believe. H.G. Wells was one the ancient people, the Indian philosopher alone seem to have some perception of the vast ages through which existence seems to have passed." "Place the name of RAMA as a jeweled lamp at the door of your lips and there will be light both inside and out. Those who repeat this name absorbed in contemplation will acquire supernormal powers. Those who repeat it when burdened with affliction will be freed from all troubles. Those who repeat it with full faith and detachment will enjoy the incomparable felicity of God"
After once reading the earlier book, Shri Krishna Lila, by Mata Devi Vanamali, we read it again and again, as it was so charming and inspiring that every reading gave added joy. So, when the author telephoned to say that she was bringing out her next book and that I should write a foreword for the same, I was filled with joy; more so because the book was entitled, "Sri Rama Lila", and I would be able to go through the manuscript in the near future. 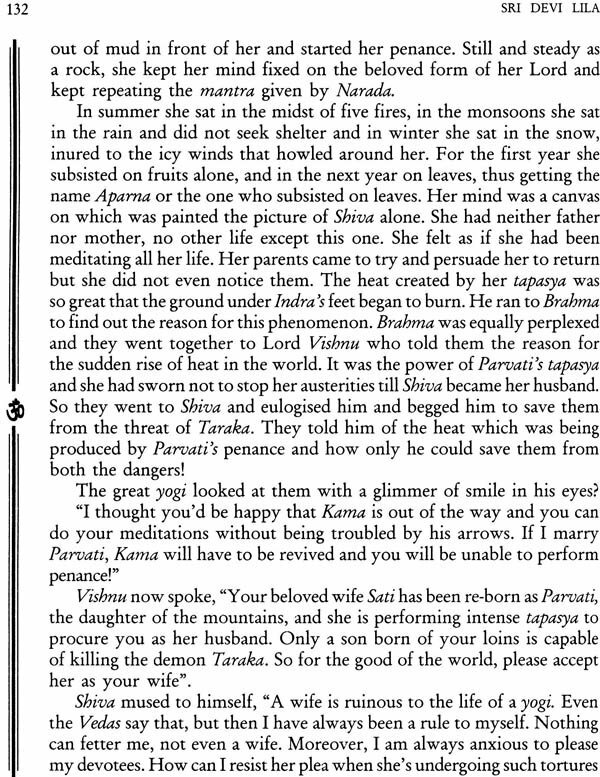 I am supremely happy that Devi Vanamali was inspired to write "Sri Rama Lila" also. Anyone who reads this wonderful book cannot but be moved to tears, unlike "Sri Krishna Lila". Though the book deals with the life of an avatara, who played the part of a perfect person, upholding dharma at any cost, the trials and tribulation He had to pass through during the entire period of His sojourn on this earth except for a few years of His childhood days and a few years of His wedded life, were so sever and heartbreaking. As the author mentions, the Ramayana is a love story. Sri Rama loved Sita Devi dearly. He had great love for His father, mothers brothers and His subjects. But His love for dharma, surpassed everything. He sacrificed everything including His wife, father and brother for the sake of upholding dharma. Such incidents which are many in the Ramayana are brought out by the author, painting the characters concerned in such striking colours that they leave a deep impression on our mind and stir the emotions so much, as to make us feel that the entire scene is enacted before us. We feel we are moving with Sri Rama right from Ayodhya to all the places where the original scenes were enacted. Many readers of the Ramayana are perplexed when they face some of the controversial issues, like why Sri Rama abandoned His wife, Sita Devi, whom He loved most. Before leaving Ayodhya for the forest He had told His agitated wife, Sita Devi, folding her in His arms, kissing her tears away, "Not knowing the strength of your purpose, O Janaki, I tried to deter you, not because I wanted to leave you but only because it was my duty to point out to you the dangers of forest life. You know that I cannot bear to cause distress to you, my lovely princess. O beloved Sita, even heaven has no charms for me without your bewitching presence. I too would love to sport with you in the woods and glades of the forest and on the mountain-tops, so make haste to gift away all your jewels and costly clothes and proceed to prepare yourself for a sojourn in the forest with me". The same Rama in later years asked His brother, Lakshmana to take Sita Devi, who was pregnant, to the forest and leave her there alone. What a sacrifice! What for? Only for upholding dharma. Then the killing of vali etc. are all controversial points for those who give the epic only an academic valve, whereas devotees who love Sri Rama as the avatara and purusha will try to accept whatever the Lord has done as perfectly correct and no question bothers their mind. They know that our puny intellect cannot understand the ways of the Lord and therefore the best thing is to accept them, as He knows best. The author however has taken pains to beautifully explain such controversial subjects. Whatever Sri Rama did was for upholding dharma and therefore for the good of humanity. They beauty of this book is that it is written by one who has great love and devotion for Sri Rama. It touches some subtle chords in the reader's heart and makes him ecstatic. The more we read it, the more devotion we develop. 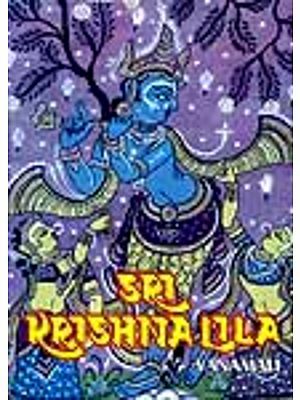 Those who have read "Sri Krishna Lila" will surely be eager to possess this book. Thus may it reach every house so that by reading it and listening to it and with the chanting of Sri Rama's glorious Name, pure love and devotion may overflow from the hearts of all to surcharge the entire atmosphere in the house with the fragrance of Sri Rama's eternal presence and make them live a life of righteousness? The Ramayana of the sage Valmiki is a literary masterpiece in the Sanskrit language which excel in beauty, style and diction. It is believed that the twenty-four letters of the Gayatri Mantra are hidden in the Ramayana. The beginning letter of every thousand words starts with one word of the Gayatri. The Gayatri starts with the word, "Tat" and the Ramayana also starts with the same word. Each word of the Gayatri is found in a consecutive sequence at the beginning of every thousand verses of the Ramayana. The Holy Ramayana is believed to be the Veda itself "Vedab prachethiasath aseed sakshath Ramayanatmana". Valmiki wrote the Veda itself in this mighty epic. Spiritual seekers read it as a protective cover for all the problems of life, and it acts as a shield. It is a well known practice amongst spiritual seekers to make a regular practice and prowess of Hanuman. No one can really plumb the depths of the meaning of Vimike's Ramayana. Usually the reading of the Mahabharata is done in the morning, of the Ramayana in the afternoon and the Sreemad Bhagavatam in the evening. The Sanskrit verse which describes this is follows: "Good people engage themselves in dice play in the morning (meaning the Mahabharata), at noon they engage themselves in theft(meaning the Sreemad Bhagavatam)". There are many controversies in the Ramayana such as the absence of Bharata during the coronation of Sri Rama, Rama's attacking Vali from behind a tree and finding fault with charges which do not seem feasible. Valmiki has produced in Rama, an aspect of human nature which is impossible to understand. He brings together in the same person the might of God and the frailty of man. This kind of presentation of the ideal man is either totally ignored by devotees or subjected to critical examination. Either way, the Ramayana is a great exercise in disciplining the mind in its attempt to bring God and man together in a single individual. Valmiki often refers to Rama as Narayana Himself. It is said that in his last moments, Ravana saw Rama as the mighty Vishnu or the God of the universe. The Ramayana should be studied diligently by everyone, for the dignity of the language in which it is written as well as the depth of the message it conveys. It presents before the reader the inscrutable manner in which God works and the fickle nature of all human decisions. Valmiki brings God to earth and raises the earth to Heaven. Since this type of blending is inconceivable to the human way of perception, by pundit, story-tellers and scholars. It is certain that an intensive study of Valmiki's Ramayana will fill the mind of everyone with inordinate strength and incalculable blessdness.Valmiki says that the glory of the Ramayana will remain as long as the sun and the moon last. The astounding descriptions of the rule of Rama and his administrative capacity reflect the very conditions of a life in Heaven Great are the Ramayana. Glory to the way of administration of Rama in every field of life in this world. Mata Devi vanamali has done a novel service to the religious community in expounding the involved meaning of the Ramayana text and making it attractive to the modern mind with beautiful English expressions. This book is a companion volume to her book on Lord Krishna called, Sri Krishna Lila. This is the story of the Lord's descent on earth as Rama, the seventh in carnation of Lord Vishnu, scion of the race of Raghu, pinnacle of human perfection. It is a story which has enthralled the minds of all who have read it, not only in India, the land of its origin, but in all the part of the world. The story of Rama has spread everywhere, including places like Tibet Turkey, Myanmar, South and South-East Asia, particularly Indonesia Malaysia and Thailand. In Bali and Thailand, as in India, Sri Rama is worshipped as God incarnate. This flow of the Ramayana outside India has been in four directions. One stream went north, as proved by Tibetan and Turkish manuscripts. The fact that it had spread to China can be seen from the Chinese translation of the two Buddhist works -Anamakam Jatakam and Dasarth Kathanakam. The second flow was to Indonesia. Stone carvings in two of the ancient fourteenth centaury Shiva temples in Jogjakarta and one in East Java at Pantaran depict scenes from the epic. Later both in Indonesia and Malaysia, Extensive literature on the Ramayana theme were composed. The third flow of the epic was to Indo-China, Thailand and Myanmar. Inscriptions dated from the seventh century show that the Valmiki Ramayana was very popular in those regions. The story of Rama which is widely read in Thailand is known as "Rama Kiyn". The Burmese version is based on this and is known as "Rama Yagan". It is one the most important poetic composition of the country. The fourth stream of the Rama story is be found in the writings of the western travelers and missionaries who visited India from the fifteenth century on wards. These writings are found in much European language like English, French, Spanish and Dutch. One may well marvel at the fact that this story, which is based on tao cast its spell through the ages. This is because the story is based on certain eternal verities, which appeal to the best in human nature. Indeed these values have such a universal appeal that the character of Sri Rama has risen above the limits of sect, religion, race and country. Obviously it is a tale which is capable of touching the human mind to a great extent. The Ramayana is an ancient chronicle, but it has a deep meaning even in modern times. We live in an age which is at loss to know the meaning of human existence, and which doubts the existence of God Himself. We are perplexed, as to how we can act with righteousness, when the whole world seems to have gone mad, when the meaning of truth and love cannot be found and when hate and self-interest seems to be the only rule of conduct, from the highest to the lowest. Answers to these perplexing questions can be found in the Ramayana, for human nature, as such, has hardly changed through the years. Situations may change, but human nature remains the same and that is why we find that many avataras have come and gone, yet humanity remains the same. But the individual can and must change if society is to progress, and the characters found in this book are worthy of emulation. Our lives may well take a turn for the better, when we read the heroic way in which Rama and Sita faced the trials and tribulations of their life. In fact, in this lies the greatness of Rama. When we read the life of Krishna we find that it is the story of a God- a divine person who was always the master of every situation and never the victim. That is why He is known as the poornavatara. In the case of Rama, however, there is a difference. In him, we see that God had taken on a human from, with all its frailties in order to show us how our aspirations for a dharmic life can be fulfilled; how we can surmount our frailties and become divine, if we are prepared to completely subjugate our ego and live only for the good of the world and act in consonance with the duties and obligation of our particular in society. Valmiki's Rama is the portrait of a man who becomes divine by shaking off the limitations of mortality by a strict adherence to truth and honour. If Rama,like krishna was above all human emotions, he would not have made such an impact on the Indian mind. Valmiki's Rama has all the qualities of average man - the attachment, the desires, the anger and the love, the compassion and the Serenity. The greatness of his character lies in the fact that he surmounted there obstacles in his character and perfected himself so that he became a superhuman, one who put his duty, above all personal considerations. This type of perfection is available to all of us, however weak we may be. Hence the popularity of the Ramayana. Rama is a character to be held up as an example to all men, as Sita is, to all women and each one of us when we their story, can identify ourselves with them and then try to perfect our own character as they perfected theirs. Once again Vanamali has brought out a unique offering for the English speaking public of India and abroad. Sri Hanuman Lila is the first book in English which portrays the character of the Monkey God fully and his exploits from birth to the present age where he is still supposed to be doing tapasya in the Himalayas. This book will be a great boon to all devotees of Hanuman and of Lord Rama. Sri Vanamali is a rare being. She is a Devotee of the Lord in all His forms who has been blessed with the compassionate desire to communicate His Lilas to the English-speaking world. In the West, there are many new devotees who desperately need access to the revered ancient scriptures of India. Sri Vanamali comes as the cool breeze of grace, filling the hearts and minds of the thirsty devotees with the stories of the Lord’s joyous play. In this book on Sri Hanumanji, as in all her other books, she gives us access to the inner world of our beloved’s Lilas. This is the key to understanding Sri Hanuman. He serves Sri Rama in all beings, by removing the obstacles for those beings who realize the truth in themselves. He sees that, in fact, there ARE no “other” beings but only Rama. Motivated by love born of truth, which manifests as compassion for beings who believe themselves to be separate, he words tirelessly to remove their suffering. Another mystery of Sri Hanuman was revealed by Sri Neeb Karori Baba to one of his great old devotees, Dada Mukerjee. A small party of devotees had, along with Maharaj ji, climbed to the top of Hanuman Dhara in Chitrakut. They rested by the spring that comes out from the rock at the top of the hill. No matter what he was doing, burning Lanka, destroying the demons, singing Ram Naam or serving the devotees, Hanuman was never outside of Sri Rama’s being. May the Lord be gracious to all. Sri Krishna Das is well known to all lovers of music especially in the West, for his numerous recordings of heart-rending devotional lyrics. Even though he is known as Krishna Das, yet he can as easily be called Ram Das or Hanuman Das since he is a devotee of both. Modern science may claim to have traced the mechanical laws of evolution, but the ancient rishis of India discovered the spiritual laws of eternal values called the Sanatana Dharma, which is the divine thrust inherent in the human psyche enabling it to attain greater heights of evolution. This is the great contribution which India has made to the world, inspiring in the human being a strong desire to shake off his humanity and bring to light the divinity which is inherent in him. This is what is known as enlightenment. Age after age, India has produced enlightened souls who have continuously renewed and refreshed this great dharma - the Sanatana Dharma - and made it available to the whole of the human race. The sages desired that our country should progress not just materially but through a constant inner renewal of the cosmic law of righteousness, guided by the wisdom embedded in our heritage. The epics and Puranas of this country are thus store-houses of wisdom and by reading them our spiritual evolution will be hastened. Truth is a matter of direct realization by our own individual efforts but the sages gave us many different methods to attain it. These saints were great souls who were far above the vulgar herd who want to see their names emblazoned in anything they write. Thus, their names remain a mystery. We can only show our gratitude to them by trying out the many paths which they gave us. We find a great urge on their part to share their vital experiences with all those who have the hearts to understand. This experience is the highest available to the human psyche and is known as brahmajnana. The knowledge by itself is not the aim of life. It has to become a living understanding in which we actually experience the unity of life underlying all living beings - in fact the entire cosmos. From this is born an overwhelming love for the whole of creation and a burning desire to see human beings free themselves from the strangling limitations and illusions of this waking world of our common experience. This type of love is totally unselfish, characterized by a deep desire to share their most cherished possession with the whole of humanity and thus we see that the rishis tried every means in their power to enable our tragic and ignorant human race to acquire that which was the sumum bonum of human life. Every human being is nothing but a reflection of the divine. Involvement in the illusions of this world alone stops us from realizing our divinity. The Upanishads give the path of jnana or wisdom, which is difficult for many to follow. They appeal only to those who are already endowed with great spiritual earnings. However, it is said that the Absolute, timeless and formless presence descends to this mortal plane in the form of the gods for certain mysterious purposes of its own. This is known as the lila or the play of god. The sages who came after the age of the Upanishads were determined to cater to the majority of human beings who might not have any spiritual leanings at all. They resorted to bringing the truths of the Upanishads forcibly to the minds of the average human being in the form of stories. The sage Vyasa, the author of the Mahabharata, was the greatest of these story-tellers. He said that if we listen carefully to a story, we will never be the same again. The story, especially if it has some spiritual basis will worm its way into our heart and break down our self-constructed barriers to the divine. Even if we start off by reading these stories as an entertainment, one or two of them will eventually slip through our defences and explode the hard shell of our humanity and disclose our divinity. These stories have an inexhaustible vitality in them so that people are never tired of listening to them. They can be listened to or read and pondered over and thus they are capable of promoting in the listener a deep understanding of life, death and destiny. Every story had implicit in it a moral value, which is likened to the fragrance of a beautiful flower. The rishis taught us that all forms are the letters of a form-world-power alphabet of a language which can help us to realize our spiritual reality, which is unconditioned by any form and yet is the supreme source of all forms. The path of bhakti, or devotion to a personal God, is forcibly brought out in the Puranas or epics which tell stories of the great incarnations and of all the numerous gods of the Hindu pantheon, which are completely in tune with truth of life. The culture of the Indian sub-continent was developed in the climate of these great epics. Every child was taught to emulate the classic examples given therein and thus bring his or her own life to perfection. 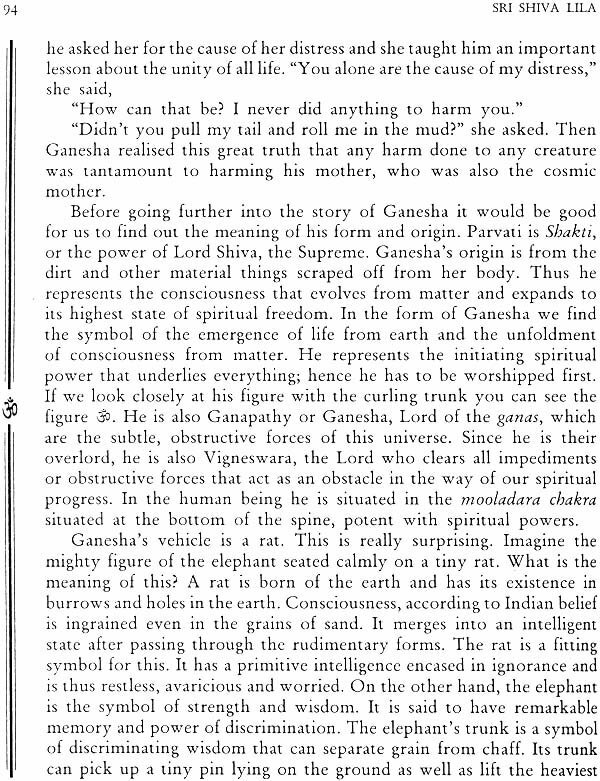 The Hindu mind had no difficulty in picturing the Supreme in the form of an animal or of a human. Thus, we find Ganesha, depicted as a human being with the head of an elephant, and Hanuman, who was a monkey. Hanuman is one of the most beloved figures in the Hindu pantheon of gods called Kimpurushas, who are actually animals but behave like humans. He is the symbol of utter and selfless devotion to his supreme deity, Sri Rama, the seventh incarnation of Lord Vishnu, scion of the solar race, the pinnacle of human perfection. Hanuman’s entire strength came through the repetition of the name of Rama, the greatest mantra for this age of Kali, which if chanted with devotion, is said to give liberation from the coils of mortal life. Every temple of Rama has a figure of Hanuman seated at his feet bowing to him. Wherever the Ramayana is read or recited, a seat is left vacant for Hanuman since it is believed that he is always present at the reading of the story of his beloved master. The Sanskrit word sadhana means any method by following which the aspirant or sadhaka can establish contact with the inner realms of her being. One of the easiest methods of sadhana is known as japa or the repetition of the name of God in whatever form we picture him. Hanuman gives us the picture of an animal that attained perfection solely by chanting the name of Rama, his personal deity and of utter and complete self-abnegation of his interests to that of his Lord and god - Rama. Humility and selflessness is a measure of our knowledge. The more we know the more we realize how little we know and how little we can do by ourselves. According to legend, Hanuman is the son of the Wind God. Air sustains all living beings. One can exist without food, spend days without water, but it is impossible to exist even for a short time without air. Air is life. Therefore, Hanuman is also called ‘Pranadeva’ or the God of breath or Life. Vaishnavites believe that the Wind God Vayu underwent three incarnations to help Lord Vishnu. As Hanuman he helped Rama, as Bhima he assisted Krishna, and as Madhavacharya (1197-76) he founded the Vaishnava sect known as Dwaita. In Hindu symbolism, a monkey signifies the human mind, which is ever restless and never still. This monkey-mind happens to be the only thing over which man can have absolute control. We cannot control the world around us but we can control and tame our mind by ardent discipline. We cannot choose our life but we can choose the way we respond to it. Truly Hanuman is symbolic of the perfect mind, and embodies the highest potential it can achieve. He is the true picture of the sthitha prajna (man of steady intellect) of the Bhagavad-Gita and had perfect control over his mind. The name “Hanuman” gives a clue to his character. It is a combination of two Sanskrit words, bonan (annihilation) and man (mind), thus indicating one who has conquered his ego. According to yoga, the body is only an extension of the mind. Hence, Hanuman who had perfect mastery over his mind had the mot developed body. He is Bjrangabali (one whose body is like a thunderbolt and whose movements are like lightning). He is so strong that he can lift mountains, and so agile that he can leap across the sea. His strength is proverbial and thus he is the patron of physical culture. His image is enshrined in gymnasiums all over India and wrestlers worship him before commencing their practice. The yogasana known as Surya namaskara, or salutation to the Sun God, is a mixture of all the main yogic postures combine with devotion and was composed by Hanuman in honour of his celestial guru, Surya. Vayu, his divine father taught him pranayama or the science of breath control, which he is turn taught to human beings. The scriptures refer to several events where Hanuman exhibited his power over the celestial bodies including the sun and Saturn. Hence, he gained power over the navagrahas or nine planets. These planets are Ravi, the sun; Soma, the moon; Mangal, Mars; Buddha, Mercury; Brihaspati, Jupiter; Shukra, Venus; Shani, Saturn; the bodiless, Rahu and the headless, Ketu. Their alignment in the astrological chart of a human being is supposed to decide a person’s destiny. 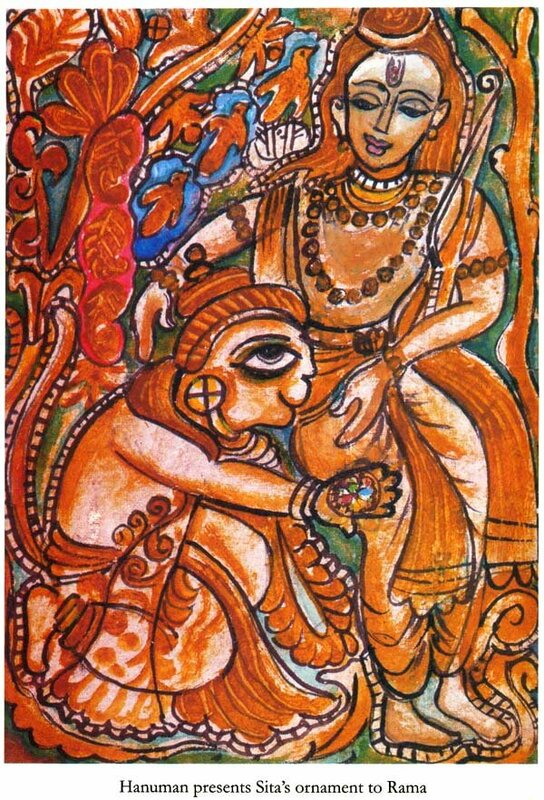 In many of his images, Hanuman is shown trampling a woman and holding her by her braid. This women embodies ‘Panavati’ or baneful astrological influences. Sorcerers manipulate cosmic powers to invoke malevolent spirits. People normally call upon Hanuman to protect them from such people. When Ravana invoked tow such sorcerers, Ahiravana and Mahiravana, Hanuman turned the tables on them and invoked the power of Kaali to subdue them. Many Tantrics worship him because he has many siddhis, or supernatural powers, like the ability to change his size and ability to fly, etc. which he gained through his strict brahmacharya and tapasya. Thus, he displays the dual characteristics of bhakti and Shakti. Either one or the other is given prominence in his shrines. He is also the patron of Ayurvedic healers since he played a vital role is saving Lakshmana’s life by bringing the magic herb from the Himalayas. He later saved Shatrugna’s life also with the same herb. As a warrior, Hanuman has no parallel. He uses both strength and guile to overpower the enemy. This was exhibited many times during the war with Ravana. He used both brawn and brain to achieve victory over his enemies. 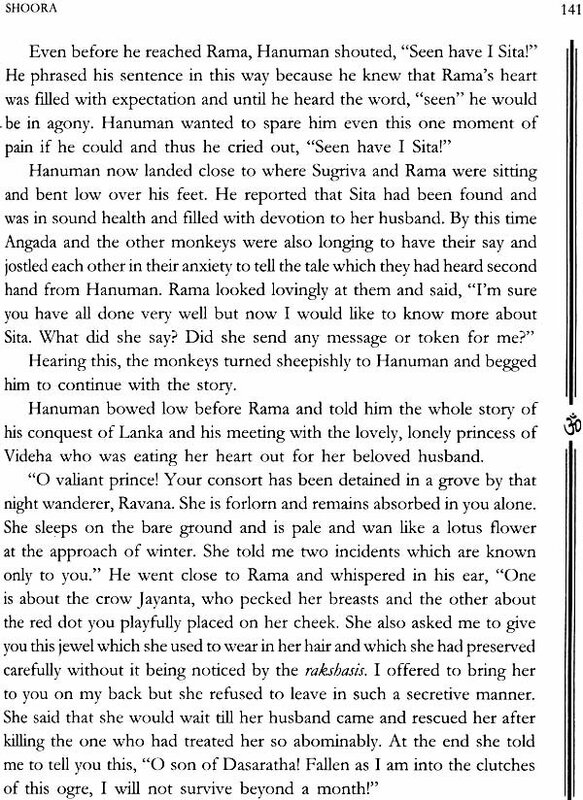 Hanuman was also a master diplomat. He knew how to speak sweetly and make others see his side of the matter, without the use of force. Hence, he was Sugriva’s spokesman when he approached Rama to find out his intentions. 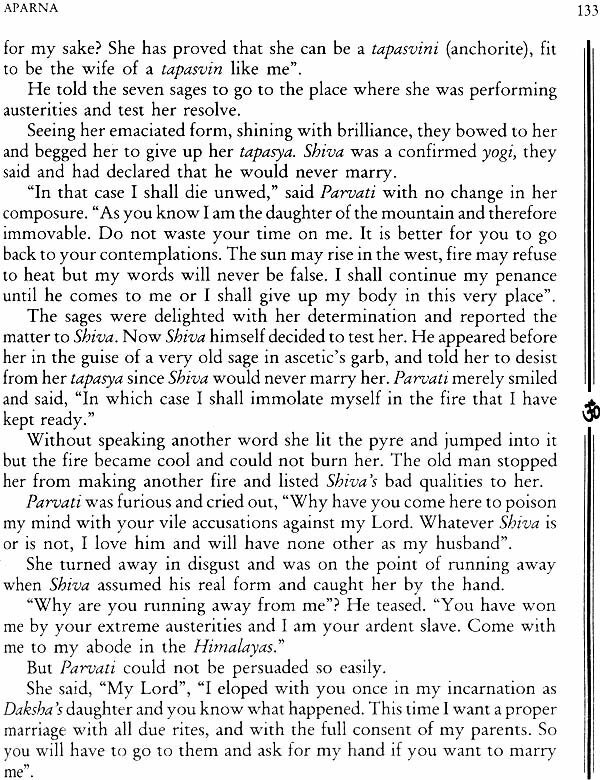 Again Sugriva sent him to try and subdue Lakshmana’s anger at his own lapse. Rama sent him as his envoy to Sita twice, once to Lanka carrying his signet ring and again to fetch her after the war. He also sent him to Bharata to find out his intentions before setting foot in Ayodhya-All those who came into contact with him were most impressed by his diplomatic method of talking and beguiling ways. Hanuman impressed both Rama and Ravana by his mastery over language, his grammar and his ability to use the right word at the right moment and in the right context as well as his perfect diction. Strangely enough, he was also a great musician. He had been blessed by the goddess Saraswati and was thus able to play on the lute and sing lyrics in praise of Rama. He was the first to sing bhajans, songs of adoration and kirtans, songs of praise. His music was an outpouring of his great love for his beloved master and hence had the power to even melt rocks. Hanuman is the perfect example of a student. He was totally focused. Hard-working, humble, determined and brilliant. He flew to the solar orb in his determination to have the Sun God, Surya as his guru. However, he never flaunted his brilliance and scholarship but always sat at the feet of Rama - ever the humble servant. Hanuman had no desire for name or fame. He preferred to live in mountains and caves. He practiced total brahmacharya, which was very strange in a simian. Even when he lived in the palace he lived like a hermit, never indulging his senses. This was what gave him so much spiritual power. He was also a hatha yogi since he practiced yogasanas and pranayama. He was a laya yogi since he knew how to control his mind with mantras and yantras. Thus he acquired many siddhis or supernatural powers. If yoga is the ability to control one’s mind, then Hanuman was the perfect yogi, having perfect mastery over his senses, achieved through a disciplined lifestyle and by a strict adherence to celibacy, brahmacharya and selfless devotion, bhakti. He controlled his mind through absolute faith in the divine. Every event in his life was a gift from his master to be accepted without question. His life is a classic example to be followed by all devotees of God in any form. He shows us how a devotee should spend his or her life so as to reach the Supreme. He symbolizes the pinnacle of bhakti and Hindus consider him to be the eleventh avatara of Rudra or Lord Shiva. Once it is said that Narada asked Brahma who he considered to be the greatest devotee of Vishnu. No doubt the sage was hoping that his name would be suggested. However, Brahma directed his to Prahlada, the king of asuras for whose sake Vishnu had taken a special avatara as Narasimha (the man-lion). Prahlada, with his characteristic humility, told him to go to Hanuman who he thought to be the greatest devotee of Vishnu since he chanted the name of Rama constantly. Hanuman was a perfect karma yogi since he performed his actions with detachment, dedicating everything to Rama, his God. He was totally free from any desire for personal aggrandizement. In the whole of the Ramayana there is no incident in which he did anything for himself. All his feats were for the sake of others. When he described the war to his mother, she childed him for not killing Ravana and rescuing Sita by himself for that would have made him more famous than Rama. Hanuman replied that his life was not given to him to gain fame for himself but for serving Rama. His utter selflessness comes into great prominence when he saw how dejected Valmiki was by his work and without hesitation threw his own immortal classic into the sea. Hanuman spent his entire life in the service of others. First he served Sugriva, then Rama. He personifies bhakti through dasya bhava or the attitude of the servant. This type of devotion is the perfect instrument to destroy the ego. He performed his duties humbly and modestly and with great devotion. He chose not to marry and have a family of his own so that he could devote himself entirely to the service of others. He never exceeded his orders even when he was capable of doing so. For instance, he could easily have killed Ravana and conquered Lanka on his own, as his mother said, but he refrained from doing so since he wanted to be the true servant and obey his master’s order. He is one of the seven chiranjeevis (those who live till the end of this cycle of creation). He is noted for his mighty intellect and is supposed to be the only scholar who knows all the nine vyakaranas (explanation of the Vedas). He is supposed to have learnt the Vedas from the sun god himself. He is the wisest of the wise, strongest of the strong and bravest of the brave. He had the power to assume any form he liked, to swell his body to the size of a mountain as well as to reduce it to a thumb nail. One who meditates on his will attain power, strength, glory prosperity and success in life. Hanuman is the epitome of wisdom, continence, bhakti (devotion/faith), valour, righteousness and strength. His indispensable role in reuniting Rama with Sita is likened by some to that of a teacher helping an individual soul realize the divine. He is easily reachable - just by chanting the mantra ‘Rama’. Conversely, it is also held that the easiest way to attain Lord Rama is to worship Hanuman. He is worshipped on Saturdays and Tuesdays, which are associated with Shani and Mangal, Saturn and Mars. Both these planets are associated with death and war and known to disrupt human life by their malefic influence. His offerings are simple. Sindoor (red lead), til oil (sesame), in the north and garlands of betel leaves in the south. In the south his idols are often pasted with butter, which strangely enough never melts even during the hottest summer. He is also adorned with garlands of rice and dal doughnuts (vadas). The reason for the vermilion paste will be given in the chapters that follow. But esoterically speaking, red is the colour of strength and virility. Til oil is used by wrestlers and gymnastics to massage their body. Butter and dal are sources of protein and generate energy, stamina and muscle. The two scriptures which are read by all Hanuman devotees are the ‘Sundara Kanda’ of the Ramayana, where he discovered Sita in Lanka and the forty verses of the Hanuman Chalisa by Tulsidas. Wherever the Ramayana is read, a special seat is always reserved for Hanuman since the belief is that he will always be present at such a reading. What are his physical characteristics? Is he the black-faced langur or the red-faced Bandar? Sometimes he is described as a golden monkey with a red face. His face is supposed to have turned black when he wiped his face with his tail after destroying Lanka. His tail is arched upwards and is the symbol of strength, agility and virility. He wears earrings made of five metals, gold, silver, copper, iron and tin. He came to the world adorned with these. Normally he wears only a loin-cloth in the manner of wrestlers and body builders. His images usually show him saluting Rama or standing guard and displaying his strength as he holds the mountain in one hand and his mace in the other. The Hanuman Chalisa declares categorically that there is no blessing that he cannot bestow. Sita granted him the power to bestow the eight siddhis and nine types of wealth on others. However, the greatest boon one can ask of Hanuman is the uplifting of the spiritual qualities that he himself is known for. Having polished with the dust of my master’s feet, the mirror of my heart, I narrate the pure fame of Raghupati (Rama), which bestows life’s four desires. Considering myself to be devoid of intellectual merits, I invoke Sri Hanuman, the son of the wind god. Bestow on me strength, intelligence and knowledge. Remove my bodily ailments and vicious qualities. (And allow me to write this book). "Till My advent O Uddhava, a dip in the Ganga was supposed to eradicate all sins, but now a dip in the holy story of My Life is enough to cleanse the sins of a thousand life-times. He who listens to the story of My Life sanctifies himself." It pleases me immensely to know that Devi Vanamali, the author of this admirable book on the life of Bhagavan (Lord) Sri Krishna, wants me to write a few words by way of an introductory appreciation and suggestion. I have gone through this book carefully and my first impression after reading it was that this is the first attempt perhaps ever made by a scholar-devotee to present in one compact volume the multifaceted and majestic life of the Great Incarnation. What charmed me especially was the perspicacious and deeply touching style and expression in which the whole story is told so beautifully and so comprehensively. Usually, devotees of Lord Sri Krishna confine their attention to the childhood and boyhood days of Krishna in Gokula, Vrindavana, and Mathura and even if they are a little more extended, the writings generally add only the events in Dwaraka, of Sri Krishna's regime and His social greatness as delineated in the Shrimad Bhagavatha Mahapurana. Very few pay sufficient attention to the wonderful deeds of the towering Krishna of theMahabharata, without which facet of His life the great story would remain incomplete. It is delightful to observe that Mata Devi Vanamali has not omitted any salient feature and has managed to press into her book the essentials of the story as we have in both the Shrimad Bhagavatha and the Mahabharata. The divine play of the child in Vrindavana, the serious posture of a mature potentate in Dwaraka, and the transcendent power exhibited in the Mahabharata constitute the three sections in the book of Sri Krishna's life. The author of this book is not merely a devotee in the ordinary sense of the term, but one who has endeavoured to saturate her very life with Krishnabhakti, due to which speciality in her, the work glows with a fervour of spirit and a radiance of clarity in presentation. A book written by a seeker who veritably lives in the presence of the Lord will no doubt have the magnetic influence it will obviously exert on every reader of this divine saga, this chronicle of God come fully in visible form. A reading of the life of Sri Krishna will not only be a rewarding treat, as an enchanting vision of the deeds of the Divine Superman, but also charge the reader's personality with an energy and vigour not to be had on this earth. May works of this kind see the light of day in more and more numbers, for the blessing of all humankind. "I know of no Reality other than Lord Krishna, whose face is as radiant as the full moon, whose colour is that of the fully laden rain cloud, whose eyes are large and lustrous as the petals of a lotus, whose lips are red as the bimba berry, whose hands are adorned with the flute, and who is clad in resplendent garments." The story of the Lord's manifestation in the world as Krishna, scion of Yadava clan, is one which has thrilled the hearts of all those who have been fortunate enough to have heard it. It is the glorious tale of how the One who is aja, or unborn, and arupa, without form, was born with a form, in this world of duality, and has delighted the hearts of people for over five thousand years. It is the story of that Infinite, Eternal One, Who was born as Krishna, the son of Yadava chief, Vasudeva and his wife Devaki, Who was the nephew of Kamsa, the King of Bhojas; Krishna, a prince who was born in a dungeon and brought up as a common cowherd boy by their chieftain Nanda and his wife Yashoda in the village Gokula. It is the story of a man Who was also God and of God Who was born, a man. There is no tale comparable to it in all times. The main facts of His life can be gathered from the Shrimad Bhagavatha and the Mahabharatha – the first half of the story, from the former and the second, from the latter. He was born in captivity in the prison of the tyrant king, Kamsa of Mathura, as the son of Vasudeva and thus was known as Vaasudeva. Immediately after birth, he was transferred from Mathura to the cowherd settlement of Gokula, where He grew up as the foster-son of their chief, Nanda and his wife, Yashoda. As a child He was mischievous and willful, charming all with His precocious acts. At the age of 12 He went to Mathura, where He killed His uncle, Kamsa, thus freeing the Yadavas from the rule of the tyrant. He grew up to be a hero, valiant and invincible, and gradually assumed leadership of the Yadava and Vrishni clans, even thought He did not accept the title of "King". He defeated many of the tyrant kings and made the Yadavas into one of the most powerful forces of His time. He founded His new capital on the island of Dwaraka, on the western seacoast of India, which was then known as Bharathavarsha, and played an important part in shaping the cultural and political life of His times. Though He did not take up arms, He played a decisive part in the great war of the Mahabharatha. As a man, He was a Mahayogi, the greatest of all yogis, totally unattached, having complete mastery over Himself and nature, capable of controlling the very elements, if need be. His miracles were only an outflow of His perfect unity with God and therefore, with nature. The spiritual gospel which He taught is known as the Bhagavatha Dharma and is chiefly expounded in the Bhagavad Gita, the Uddhava Gita, and the Anu Gita. The simplicity of His teaching was such that it could be followed by any man, woman, or child, unlike the Vedic teachings, which were meant only for the elite. The Vedic religion had elaborated into a vast system of complicated sacrificial rituals, which could be deciphered and performed only by the Brahmins and conducted only by Kshatriyas. Out of the Vedic religion had developed the glorious philosophy of the Upanishads, which required high intellectual ability, moral competence, and training under a qualified spiritual preceptor, or guru, before it could be comprehended. The advent of Lord Krishna came at a time when the common man in Bharathavarsha was without a simple religion that would satisfy his emotional wants and elevate him spiritually without taxing him too much intellectually. The Bhagavatha Dharma provided a devotional gospel in which action, emotion and intellect played equal parts and proclaimed Krishna as Ishvara (God), Who had incarnated Himself for the sake of humanity. He could be communed with, through love and service, and responded to the earnest prayers and deepest yearnings of the ordinary person. Thus, Lord Krishna were not only a precocious child, an invincible hero, and a Mahayogi, but He was that Supreme Immaculate, Whose contact transforms even sinners into saints, ignorant men into sages, sense-bound beings into spiritual ecstatics, and even animals into devotees. Krishna is the human version of the metaphysical Satchidananda Brahman (existence-consciousness-bliss) of the Upanishads, Who took on a human form, to help the ordinary mortal to attain union with the formless Brahman (the Indivisible Absolute) through bhakti or devotion alone and not merely through the path of meditation and Samadhi (super-conscious state), as advocated in the Upanishads. All His human actions during the span of His earthly life were meant, not only to bless His contemporaries and establish righteousness on earth, but to provide a spiritually potent account of His earthly deeds, for the uplifting of the future generations. By meditating on these stories, one can establish a devotional relationship with Him, similar to that which His great devotees had during His lifetime. He is the expression of the redeeming love of God for humanity, which manifests itself in different ages and in different lands, bringing spiritual enlightenment and bliss into our otherwise dreary life. The theory of the avatara, or the descent of God into the human form, is one of the established beliefs of Vaishnava theism and is very difficult for the modern mind to conceive. If we believe in the unborn, impersonal godhead of Brahman, how can we accept the fact that it can be born as a human personality? The Vedantic view postulates that everything is divine. Every particle in the universe is imbued with the divine spirit. Far from the "Unborn" being unable to assume a form, Unborn Spirit, Who is without beginning and without end. The assumption of imperfection, by the Perfect, is the whole phenomenon of this mysterious universe and can only be attributed to the divine lila, or play. "Avatara" means "descent," and this descent is a direct manifestation in humanity by the divine, in order to aid the human soul in its ascent to the divine status. It is a manifestation from above, of that which we have to develop from below. It is to give the outer religion of humanity, an inner meaning, which will enable it to grow into divine status, that the avatara comes. The ordinary person has to evolve and ascend into godhead, but the avatara is a direct descent into the human form. The one is a birth from ignorance into ignorance under the shroud of Maya, or the cosmic veil of illusion, and the other is a birth from knowledge into knowledge, with all powers intact and a full awareness and consciousness of His supreme status. He is thus a dual phenomenon, for He appears human and is yet divine. This has to be, for the object of the avatara is to show that a human birth with all its limitations can still be made the means for a divine birth. If the avatara were to act in a superhuman way all the time, this purpose would be nullified. He might even assume human sorrow and suffering, like Christ or Sri Rama, in order to show that suffering itself may be the cause of redemption. The Krishnavatara is unique because even in hours of sorrow and travail, He showed Himself to be a complete master of the situation, thus exemplifying the truth of how one who is established in unity with the divine, can remain unaffected in the midst of pain and sorrow. Hence, this avatara in the form of Krishna is known as purnavatara, or the complete descent of the entire divinity into the form of humanity. The Bhagavad Purana declares, "Krishnasthu Bhagavan Swayam". Krishna is the Supreme Lord in His completeness. Even during his lifetime, He because canonized among those of His own clan, as well as among many others. He was looked upon as the incarnation of Vishnu, the godhead of Vaishnava theology and the preserver, in the trinity made up of Brahma, Vishnu, and Shiva, who is invoked in the great Gayatri hymn. In the course of time, Vishnu became the most dominant among the Vedic deities and came to be accepted as the Supreme Being. By worshipping Krishna as an incarnation of Vishnu, one can gain the status achieved by striving yogis through the difficult forms of various yogic practices. The charm of His avatara is the perfection with which He played every role He was called upon to play. He was a staunch friend, a dutiful son, an exciting lover, and a model husband, not to just one, but to all women who desired Him. There was none who called to Him with intensity, to whom He did not go with speed! "However a man approaches me, in that same manner do I go to him," was His creed. In whatever guise people looked upon Him – as son, lover, or husband – He went to them in that very form, in which they visualized Him and satisfied their desires in the way which was most meaningful to them. At the same time, He sublimated their desires and thus fulfilled their earthly lives and led them to eternal bliss. There was no one who approached Him, whether saint or sinner, in hatred or fear or love, who did not attain liberation The difference between a Kamsa, who tried to kill Him, and a Kuchela, who worshipped Him, is light indeed. One approached Him with hatred and the other with love, but both thought of him constantly and were thus rewarded with moksha, or liberation. An object of mortal dread and antagonism can produce as much absorption in the mind, as an object of love. If this object of dread happens to be God, concentration on Him, though motivated by antagonism, must purify the person, just as potent but unpleasant medicine can effect a cure. This is what the Bhagavad Purana declares. Thus Lord Krishna is not only the Sat-chid-ananda, the existence-knowledge-bliss, of the Absolute, without any diminution or contamination of His perfection, He is also the Uttama Purusha, the perfect person, amidst all imperfect situations. He is the eternal boy, the paragon of masculine beauty, Who always retains His spiritual nobility, absolutely unaffected and unperturbed in every situation, be it amidst the poverty and hardships of the cowherd settlement, the rigors of a hermitage, the seductive charms of dancing beauties, the gory scenes of the battlefield, in the self-destructive holdcaust of His own kith and kin, or in the peaceful interludes with His friends. As He Himself taught, Krishna lived in this world of duality as the lotus leaf in water, absolutely untouched and unaffected by the environment, a witness of situations, never a victim. The river of time collects much flotsam and jetsam on its way, and the story of the Lord's life has been embellished with a wealth of detail, perhaps true, perhaps imaginary. Fact and fiction, truth and fantasy are entwined. But the final test of truth is time itself. It is the true touchstone. It deletes the dross and retains the gold. The story of a divine manifestation is always filled with mystery and defies all attempts at human analysis. But it has the quality of being svayamprakasha, or self-illuminating, and therefore the person who narrates it, will find illumination coming from within, for Krishna is the charioteer seated in the heart of everyone, the supreme guru. In and through the seemingly redundant detail that has woven itself around the story through the centuries, it retains its breathtaking beauty, for it is dominated by the powerful influence of Krishna's enchanting personality, in which the wisdom of the seer is mingled with the charm and simplicity of a child and the glory of God gushes forth in an inexhaustible fountain of divine love and wisdom. The story of such a life can only be written by His grace and can only be understood by His grace. May that grace flow into us, inspire and enlighten us, and lead us to eternal bliss! Glory to Lord Krishna – to Vanamali – the wearer of the garland of wild flowers. Our first relationship in the world is through the mother. The Earliest memory of any person is that of clinging to the mother's breast and looking into her love-filled eyes. The comfort and security, which the infant gains from this relationship, lasts with him all his life. In the mother is centered a whole world of tenderness, comfort and sustenance. To transfer this concept to a cosmic being was a natural step, which all the ancient cultures took. Therefore the concept of the Divine as the Mother is as old as life itself. Devi is the Divine Mother, the eternal womb of all creatures- human, sub-human and animal. She cradles her children in her loving arms, suckles them and nurtures them with her infinite love. Wherever you see maternal love, in a bird or animal or human, know that to be the love of the Devi for her children, for she is the universal mother. This book takes us on ancient quest to unravel the mystery of the Divine Mother in all her manifold aspects. This is one of the most comprehensive and fascinating books on the mystery of the Divine Mother, written in a clear lucid style which can be easily grasped by everyone. The Devi is synonymous with Shakti or divine power that manifests sustains and transforms the universe into one unified form of existence. Shakti has all the attributes of the Supreme- Power, Knowledge and omniscience. They cannot be separated. They are like fire and heat. Worship of Devi is not sectarian. It is applicable to everyone. Mata Devi Vanamali-Mataji, as I shall refer to her hereinafter, is a fit person to write about the Divine Mother of the Universe. Mataji is a deep devotee who is also filled with India’s ancient concept of wisdom or jnana. Because my own devotion to God finds particular expression to the Divine Mother, I was deeply touched when Mataji asked me if I would write a few words of introduction to this beautiful book. Yet religion in these times has become too rationally formal and therefore too rational altogether. Years ago in America, the inspiration came to me to spread the concept of God as Mother and not only as Father. I wasn’t thinking of the virgin mother only, as is more common in the West but of the formless Infinite in its motherly aspect. I went to many Western shrines dedicated to the Divine Mother and worshipped there. I received in each of them great inspiration and love. And I say now, is it not time for dogmatic religion to be replaced by devotion and love? There has been too much thinking about God. Mankind must learn to love Him, to talk with Him and to experience Him. And that ‘Him’ needs to be understood, first in its higher impersonal aspect, then brought down to earth in its more truly personal aspect as the Divine Mother. For god in ‘His’ different aspects, though one in essence, is different in every aspect. It matters not only how we ourselves look upon God and define Him in our minds, it is a question also of how God views us. If we invoke God as the Divine Mother, She comes closer to us. The Infinite-beyond all sexual differences, is the maternal as well as paternal principle- opens its heart to us when we appeal to it as Mother. “If She doesn’t answer, Papa, why do you waste your time calling to Her?” The little girl then ran off with a childish laugh. When Ram Prasad came indoors later on, he told his wife how their daughter had come and helped him with the fence and talked to him playfully. Thus did Ram Prasad come to know that the Divine Mother Herself had come to him and teased him. All aspects of God hear us when we pray, but the Divine Mother listens to us- I don’t say more so but more particularly. For we are her children. She cares for each one of us in a special way. When we err, she will spank us through the law of karma. But when we love her, she also forgives. For she is ever anxious for us to understand that we may return with outstretched arms to her lap to infinity! The ancient sages of India looked at this amazing world, filled with beauty; filled with fascinating and horrifying forms and wondered what it was all about. Was this the only face of the creator or was there something beyond this? Somehow they were sure that this extraordinary universe with its myriad structures was only the mask that hid the visage behind. There are many path laid in the scriptures for discovering the truth underlying the phenomenal world as well as the truth of one’s own self and these are known as yoga. But what we should remember is that all the paths of yoga are only different methods by which this golden lid can be removed. Hindu philosophy asserts that the Brahman is the Supreme Reality underlying both the manifest and unmanifest states of Being. It is an integrated state, which is changeless, indivisible, without distinctions and utterly beyond human comprehension. It can only be known by direct experience by penetrating through and transcending the levels of the mind on the material plane. By this, consciousness becomes aware of its own real, undying nature, which is also the nature of the Supreme unmanifest. The individual spirit or atman is a centralized or contracted expression of the Brahman. It contains the whole in a potential form. Even though it is nothing but an expression of the Supreme Consciousness, it has been obscured by the limited, mental world of the individual when Pure Consciousness descends to the individual frame, it begins to relate to its limited body and displays itself in different ways according to its inherent nature and thus plays its own distinct role in the drama of manifestation. Although these centres of consciousness in the individual frames appear to be many, they are actually not separate. In the manifested realm they function separately through the agency of their separate minds. In the realm of the unmanifest, however, they cannot be considered as separate since they have emanated from the One Supreme Consciousness. This is a divine mystery, which can only be solved by the direct realization of the source from which they have sprung. Thus, a reverse process is possible and the jivatman (embodied soul) is capable of withdrawing in wards to its central source through yoga and contemplation and developing to its full divine status. Cosmic evolution proceeds from the Absolute, super conscious unmoving, unknowable, and unmanifest to the conscious, moving, knowable and manifest microcosm. Human evolution is a return journey from the gross physical plane of the microcosm back to the Absolute. In one case the force is centrifugal and in the other centripetal. Thus, all embodied souls represent different expressions of the Ultimate Reality of the Brahman, which is whole, indivisible and integrated through different centres of consciousness. Brahman is the uncaused cause of everything, the one source of all qualities and forms, though in itself it has no qualities or forms. From this basic standpoint, Hinduism gives us freedom to worship God in whatever shape that appeals to us. Each individual is given the liberty to accept any form of the divine that appeals to her or him as her personal aspect of Reality, dearest to her heart. The logic being, that which is formless, can take any form. This is the basis of the great tolerance found in the Hindu religion. Since the Brahman is formless and qualityless, any form can be worshipped as ‘Its’ form. "Vanamali has knitted this book so beautifully. This is helpful for devotees who follow both, the path of Bhakti and knowledge. She gives a deep insight into the concept of Lord Vighneshwara, Lord Kartikeya and Lord Dharma Shasta. Her work is Universal and would be helpful for people in all walks of life." In this book, Vanamali has given us a fascinating glimpse into the lilas of the three sons of Shiva. This is a captivating book for all those who are interested in knowing the esoteric secrets of Hindu gods. Shiva and his sons are all aspects of the great electromagnetic forces that control life. Shiva is the source of all energies. He is the nuclear energy underlying the subatomic particles. At the very core of matter Shiva whirls in his cosmic dance as Nataraja. Ganesha is the god of gravity which is the base of all ordinary existence. Kartikeya is the power of the electromagnetic field. His spear signifies the elemental forces of thunder ad lightning. Ayyappa is the force of love as the supreme power which is capable of uniting humanity. Ganesha symbolizes the idea of the emergence of life from earth and the unfolding of consciousness from matter. 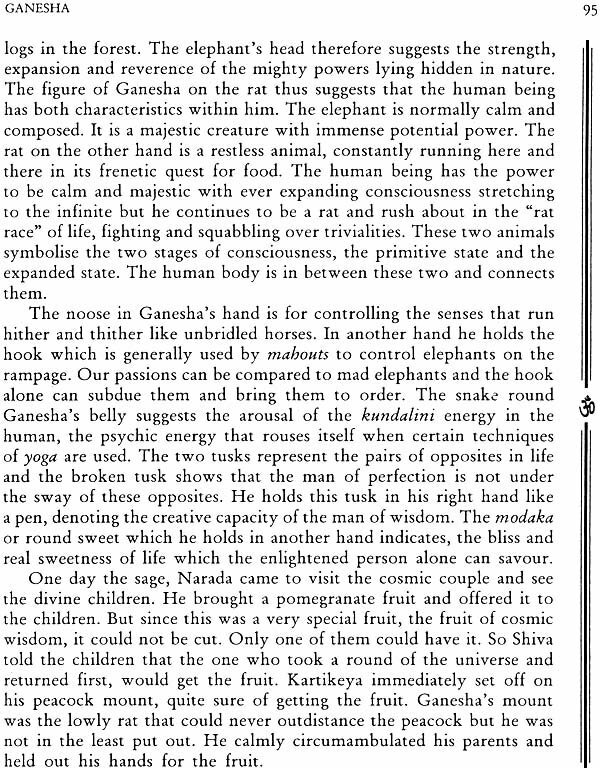 His dual form of animal and human indicates a sublime theme, which points out us us that we too can aspire to a supramental level even though we have evolved from the animal. The stories of Ganesha, Kartikeya and Shasta are all part of Puranic literature and they cater to the multifaceted intellect of the human being who craves for different expressions of the godhead. By His Holiness Sri Shivarudra Balayogi Maharaj! No Hindu ritual or Spiritual Exercise begins without an invocation to Lord Vighneshwara, the remover of all obstacles. Remembering Swami Kartikeya as the Deva Senapati is also equally important. Saint Devi Vanamali is very humble and sincere. Her life is dedicated to the service of humanity in whom she sees her God. She is doing a wonderful service by adopting a village and helping the children to get educated amongst other services. I was touched by her simplicity. To go and sit in her Ashram on the banks of the beautiful Ganga in Rishikesh is always a wonderful experience for any spiritual seeker. She has knitted this book titled "The Lilas of the Sons of Shiva" so beautifully. This is helpful for devotees who follow both, the path of Bhakti and Knowledge. She gives a deep insight into the concept of Lord Vighneshwara, Lord Kartikeya and Lord Dharma Shasta. Her work is Universal and would be helpful for people in all walks of life. We wish long life to Devi Vanamali and may humanity be benefited by her Services. In order to understand the stories of the gods, it will be good to go into the history of the Sanatana Dharma, or the ancient law of righteousness, as the Hindu religion was known. This most ancient religion rests upon a vast canon of Puranas, Vedas and Agamas that include both revealed scriptures as well as those, which are the result of the inspiration of the ancient sages. The Puranas belong to the second category and contain an encyclopaedia of sacred wisdom. Scientists and Western oriented philosophers are only just beginning to appreciate the deep psychological and metaphysical wisdom preserved and transmitted in the form of puranic lore and legend. This tradition maintains that there was once a period when there lived a class of highly evolved souls in India called risbis or munis, who had the gift of inner vision and were able to see the past, present and future. They could go to the realms of the gods and demons, the demigods and the titans of our mythological lore and describe the events that went on at that time or would take place at a future time. Let us try to take a glimpse at the Age of the rishis - the Vedic Age. The Vedas are the most ancient record of human wisdom known to man. The modern age has suddenly discovered their potential and a lot of interest is now centred on them. But unfortunately very few care to find out about the life of the rishis who were the immediate cause of their coming into existence. Of course it is a fact that they did not care to reveal anything about themselves. However it is possible to glean something about their lives and ideas from the Vedas themselves. So let us try to find out their secrets as far as possible. These seers or sages or rishis were superior to the gods. They existed before the gods. In fact they were the ones who brought the gods into existence. They were the supreme creators! Vasishta, Marichi, Angiras, Pulastya, Pulaha, Kratu and Atri were the seven great rishis - the sapta rishis - who were the mind-born sons of Brahma. Later on two more, Brighu and Daksha, were added to the list of the sons of Brahma. They are called Vedic seers because they saw the hymns of the Vedas. They were not the only ones who saw or heard the hymns of the Vedas. Many other names like Visvamitra, Gautama, Bharadvaja, Agastya,Jamadagni, Kausiki and Markandeya are found in the Vedas. These Masters were not just Indians even though they were born on the soil of India. They were Super Humans. In them, human evolution reached its zenith. The rest of the history of the human race is a decline from their superior heights. These spiritual giants strode across the Indo-Gangetic plain long before-the dawn of historic time. They were the sublime expressions of the perfect human being. They were the crown and cream of Nature's evolutionary cycle. Modern man has only recently begun to envisage the possibility that such specimens of humanity can exist. These men were really supra human, superior even to the gods. No one knows how old they were. They were ancient. They had the power to choose the hour of their departure from this world. It is said that some of them like Markandeya, continued to live in the eternal snows of the Himalayas, unseen by any human eye. In fact one of them known as Bhogarnatha still exists and we will be taking up his story in the portion on Kartikeya. It is because of the power of their tapasya (austerity), that the world continues to retain its integrity. They had extraordinary powers. They could control the elements, travel with ease in astral worlds, cover vast distances rapidly through the sky without any aircraft, catch sound and light waves in their mind and see what was happening miles away as if on a TV screen. Their look could cut through rocks and drill holes in metals and they could have anything they wanted just by formulating a wish in their minds. Yet strangely enough these men had no desires. They did not wish to conquer or control, they were content with whatever nature provided, they did not yearn to possess more and more for the simple reason that they possessed the wish- fulfilling cow of plenty in their own minds which was capable of granting their every desire. Having found the secret of all existence they continued to live only with the one desire, which was to serve the rest of creation. Loka- samgrahamevaapi - this was their creed - "For the good of the world!" They needed no commandments to keep them to the right path for they were the very embodiments of all commandments, of dharma or the cosmic order! The age of the Vedic rishis is amazing for this one thing. They had so much of mental power that they could materialize or create anything they wished. Yet we find that they did not bother to conquer countries or control other or make palaces and edifices that would last forever. They did not seek to carve in stone or wood or make effigies or temples or in anyway try to immortalize themselves in this world even though they were perfectly competent to do so if they wished. They made themselves known exclusively through their words. They have left nothing else. They left no chronicle of their achievements, nor images that might have survived the course of time. They knew that this world was only as real as the morning mist and would melt with the rising of the sun. The sun of their consciousness was at its zenith and they did not desire the trifles of the world. We see from the Vedas that these rishis were capable of anything that the mind could conceive. The Vedas describe fabulous palaces, gardens, divine beings and events. The rishis could travel with ase to other planets and create all sorts of fantastic things including modern devices such as aeroplanes and even atomic bombs. The only instrument they needed or used was their mind. Using mental power alone, they were able to discover many things in the field of astronomy, physics, astrology and medicine. Their predictions in the field of astronomy and astrology have been proved to be true only in the last millennium. Before that nobody could even understand what they were talking about. Only modern computers can verify their mathematical calculations. No human brain is capable of it even today.